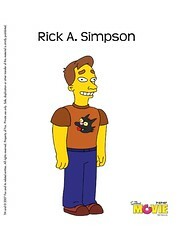 In case you’ve been living under a rock lately, you know that The Simpsons Movie is coming out soon! So in celebration, make an avatar of yourself as a Simpsons character at the Simpsons Movie website — here’s me as a Simpson. Bushy eyebrows included, of course.